I've searched in SE for solfege and names of altered notes or tones. This point seems to be cleared. But I couldn't find any about hand-signs for solfege. What are the solfege hand-signs? In our school system this was a practical method to introduce children in singing and music theory. It seems to me there is a lack of knowledge about this successful method that sadly also get unused in Switzerland. Obviously the syllable spellings are a little different from what we would use today. There is probably a more up-to-date resource for this out there. What are the hand-signs in solfège? The hand-signs are used as a help to show the pitch of the tones of a tune without sheet music (these signs are very useful for learning a melody or just for training intervals and scales). They are associated to the relative note-names (do re mi). Because of this strong connection the benefit of the hand-sign for music education of children and adults (self-training) can't be understood without the knowing the benefit of the doremi. This method is also known as the tonica-do method of Zoltan Kodaly, a musician colleague of Bela Bartok. "The Kodály method uses a system of movable-do solfège syllables for sight-singing: scale degrees are sung using corresponding syllable names (do, re, mi, fa, so, la, and ti). The syllables show function within the key and the relationships between pitches, not absolute pitch. Kodály was first exposed to this technique while visiting England, where a movable-do system created by Sarah Glover and augmented by John Curwen was being used nationwide as a part of choral training. Kodály found movable-do solfège to be helpful in developing a sense of tonal function, thus improving students’ sight-singing abilities. Kodály felt that movable-do solfège should precede acquaintance with the staff, and developed a type of shorthand using solfège initials with simplified rhythmic notation." 1935, along with his colleague Jenő Ádám, Zoltan Kodaly embarked on a long-term project to reform music teaching in Hungary, creating a new curriculum and new teaching methods. Kodály’s efforts finally bore fruit in 1945 when the new Hungarian government began to implement his ideas in the public schools. 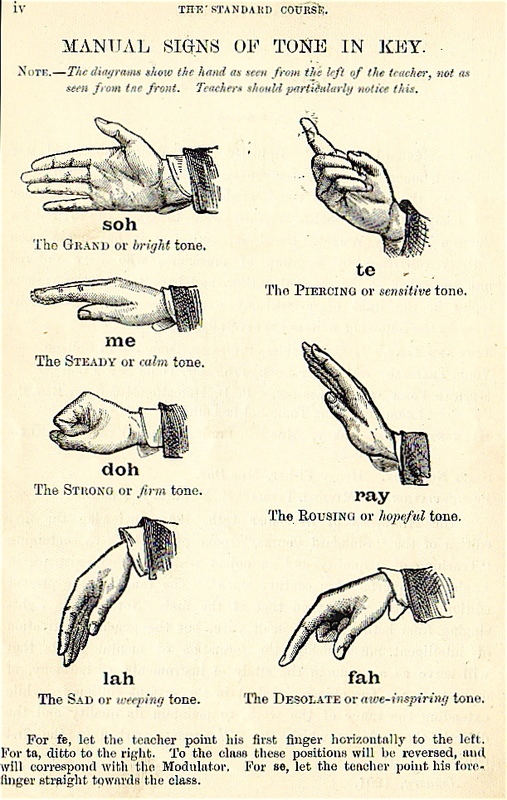 Depiction of Curwen's Solfege hand signs. This version includes the tonal tendencies and interesting titles for each tone. Hand signs, also borrowed from the teachings of Curwen, are performed during singing exercises to provide a visual aid. This technique assigns to each scale degree a hand sign that shows its particular tonal function. For example, do, mi, and so are stable in appearance, whereas fa and ti point in the direction of mi and do, respectively. Likewise, the hand sign for re suggests motion to do, and that of la to so. Kodály added to Curwen’s hand signs upward/downward movement, allowing children to actually see the height or depth of the pitch. The signs are made in front of the body, with do falling about at waist level and la at eye level. Their distance in space corresponds with the size of the interval they represent. In 2016, computer scientists at Northwestern University invented an instrument which is controlled by the hand signs, facilitating their learning. Not the answer you're looking for? Browse other questions tagged theory voice solfege or ask your own question. Learning an alternative moving-do solfege — futile? Are there solfege syllables for diminished and augmented imperfect intervals? Siler 'international' solfege system. Pros, cons? Solfege (aka Do Re Mi) in natural minor scale? What are the solfege syllables?